The port of Riga is an important part of the city's development and history, and was used for international trade between the Baltic Sea and the Black Sea as early as the 5th century. In the 12th century a small village, that is now Riga, was created on the river bank. The location provided a natural port and shelter for cargo and passenger shipping. 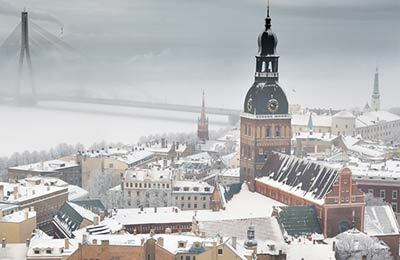 Riga Ferry port links Latvia to Stockholm, the capital of Sweden and the most populated urban area in Scandinavia. The Riga to Stockholm route is operated by Tallink ferries, and with the simple booking form from AFerry you can find your ferry quickly and easily. Below, you can find all ferry times from Riga port, as well as our best deals. Each Tallink vessel provides a wide range of modern onboard facilities including restaurants, bars, disco, business lounges, wireless internet connections, TVs, shops and children's play areas. Whether you are on holiday or a business trip Tallink offers a fantastic onboard service. Riga port offers tourist information and a terminal building alongside shops, restaurants and cafes. There are also toilet facilities available. 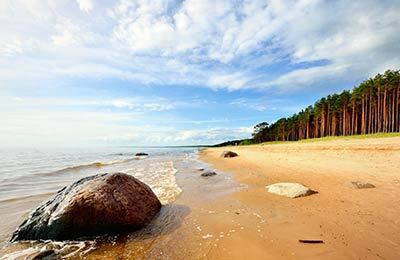 The ferry terminal is located just 10-15 minutes' walk from Old Riga and 13km from Downtown. Riga's international airport is located only 20 minutes away from the city centre. Riga is the capital of Latvia and is the largest city in the Baltic. The city is located on both banks of the river Daugava, which seperates the city in to two sections; the Vecriga (Old Riga) and Pardaugava. The port of Riga is an important part of the city's development and history, and was used for international trade between the Baltic Sea and the Black Sea as early as the 5th century. In the 12th century a small village, that is now Riga, was created on the river bank. The location provided a natural port and shelter for cargo and passenger shipping.